Showing 40 of 21127 results that match your query. Product - Turn-N-Tube 5 Tier Corner Display Rack Multipurpose Shelving Unit, Dark Brown Grain & Black - 57.7 x 11.6 x 11.6 in. 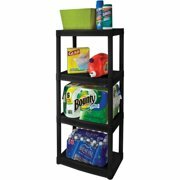 Turn-N-Tube 5 Tier Corner Display Rack Multipurpose Shelving Unit, Dark Brown Grain & Black - 57.7 x 11.6 x 11.6 in.